10 Best Kigurumis for Sale (2018) | Nerd Much? What combines an adorable costume/mascot and comfortable pajamas to wear around the house? Kigurumis! Adult onesies, otherwise known as kigurumis, have gained quite a bit of popularity the past few years, especially among anime fans, cosplayers, and pop culture enthusiasts. The word kigurumi combines two Japanese words: kigu (‘to wear’) and nuigurumi (‘stuffed toy’). The style of these pajamas are a very loose fitting onesie that has a very long torso and is usually characterized by a hood. Not only are these nerdy products absolutely cute and oddly flattering, they are not limited to pajamas. Kigurumis can be worn to lounge, outside the house, at conventions, or even at your job (if your boss is cool with it. Mine is). Below is a list of awesome adult onesies, combining officially licensed American brand pajamas and the Japanese SAZAC brand of kigurumis. Warning! Although it may be tempting, many kigurumis on the web may show up as $20 when you search them. These are knock-offs and are not officially licensed. $20 kigurumis, unless on a super sale, are also poorly made and are usually thinner than the actual brand. Please support the official SAZAC brand or other officially licensed outlets (many of which you can find on Amazon). Although it might be significantly cheaper to get a $20 kigurumi rather than a $60 one, the product won’t last and buying can hurt the official company financially. Star Wars has a great year with quite a bit of new merchandise and a dedicated fanbase that has lasted since the release of the first movie. This Chewbacca Adult Onesie is perfect for any Chewbacca fan and is definitely a great option. The fur hood is absolutely adorable and can serve as a great pajama piece or Star Wars movie premiere costume. It will be undeniably soft, especially with the microfleece material. 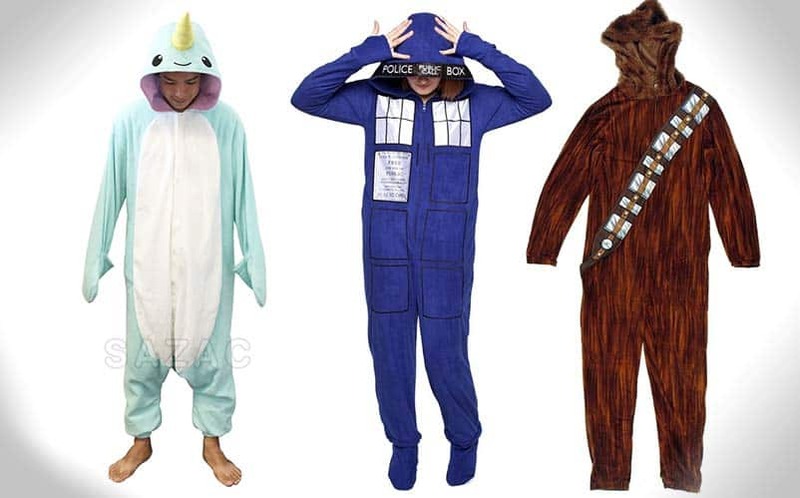 Fans of Doctor Who can rejoice as there are several options for pajamas based on the hit series. One of the cutest options is this Tardis onesie, complete with the “Police in a Box” Hood. The window design is also a nice touch to the complete outfit. If fans want to look more like one of the doctors, there are also onesie pajamas that look like the doctor’s iconic outfits. Na-na-na-na-na-na-na-na-na-na-na-na-na-na Batman! This Batman Adult Onesie is one of the most unique superhero onesies out there, especially since it could probably pass for a costume and comfortable pajamas. The attached hooded mask is a really nice addition, as well as the gray cape. Of course, this costume is just not limited to Batman fans, as it definitely be Batgirl pajamas as well. Not a DC fan? No worries, there are plenty of superhero onesies out there, including famous Marvel heroes. Since penguins have long torsos, a penguin kigurumi works well and looks cute. The eyes and beak look extra adorable, making this a perfect fit for winter. Anyone who purchases this should try to walk like a penguin because it’s a very convincing costume. Cat lovers unite! For people who adore kitties, there are plenty of options for kigurumis, including this gray tabby one. It looks unique and has a cute little red collar on the neck. Other options include a spooky cat, a black cat, and more! Kigurumis are meant to be adorable, not scary, and this Dinosaur Onesie proves that perfectly. Appearing more like a mascot than a vicious creature in Jurassic World, the SAZAC dinosaur kigu is simply great. If you do not like the pink and want a more “realistic” color, there’s a green option as well. Anyone who’s watched Toy Story will know of the green alien men from the animated movie who are part of the vast collection of Andy’s toy box. The pajamas are very accurate to their character, and the signature green hood is perfect. Because it is more specialized, this kigu is a bit more expensive than the others, but is ultimately worth it for any Toy Story or Disney fan. That being said, there are other Disney options on SAZAC’s website and Amazon, including Stitch from Lilo and Stitch, Donald and Daisy Duck, Goofy, Chip and Dale, Mickey, Minnie, and more! Upupupupu! Fans of the popular mystery visual novel, Danganronpa, will love the Monokuma and Monomi kigurumis, based on the popular mascots of the series. This style has the iconic color split and face changes between the two sides; black and white for Monobear, and pink and white for Monomi. Monokuma is the evil bear monitoring the students of Hope Peak’s Academy in their death game and class trials, while Monomi, who appears in Danganronpa 2, is supposed to be the cute rabbit who is Monobear’s foil. Either way, fans of the game or anime are bound to love this specialized kigu. Narwhals are unicorns of the sea and should be represented even more. This Narwhal kigurumi is probably one of the most adorable ones on the market, especially with the vibrant colors, cute eyes, and little horn in the front. The smile is also quite cute, as well as the flippers. This will be one I’m adding to my Christmas list. Last but not least is the Snowman Kigurumi, a great choice for the winter months. Whether it’s a night on the couch with a delicious cup of hot cocoa or a family Christmas party, this comfy holiday adult onesie is sure to put a smile on someone’s face. The hat and scarf are very festive, as well as the overall Christmas theme. There is also a Santa onesie on Amazon and SAZAC’s store! Either make for great nerdy gifts. See More Cool Kigurumis here.